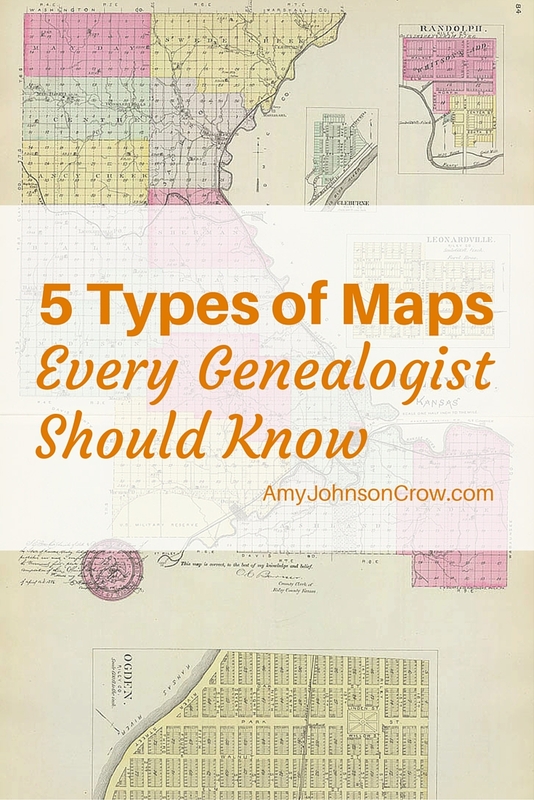 Maps are incredibly useful in our genealogy. They can put our ancestors in context with their surroundings like few other sources can. 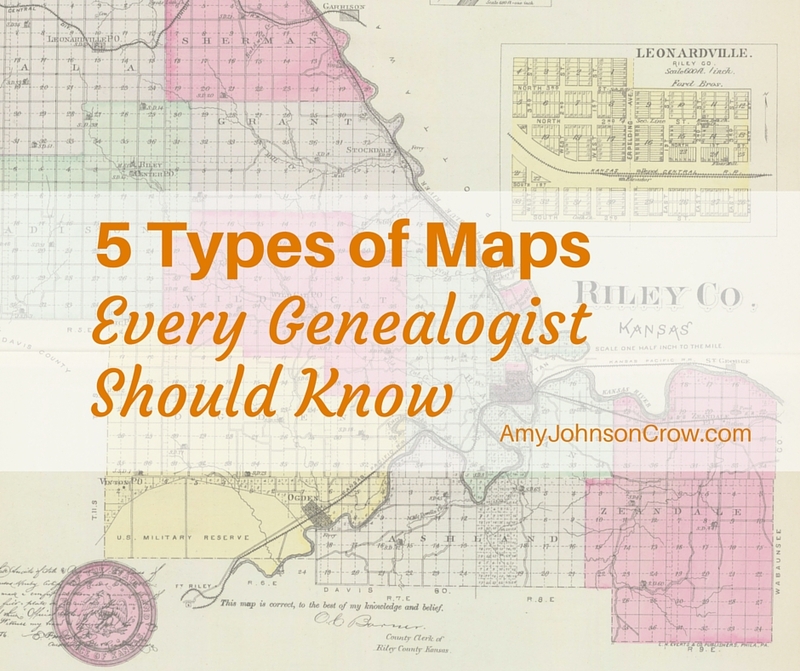 There are numerous types of maps, each with its own benefits to our research. Here are 5 types that you should know. Just like the name implies, a boundary map shows the boundaries of a particular area. They are great for getting an overview of how things relate to each other. 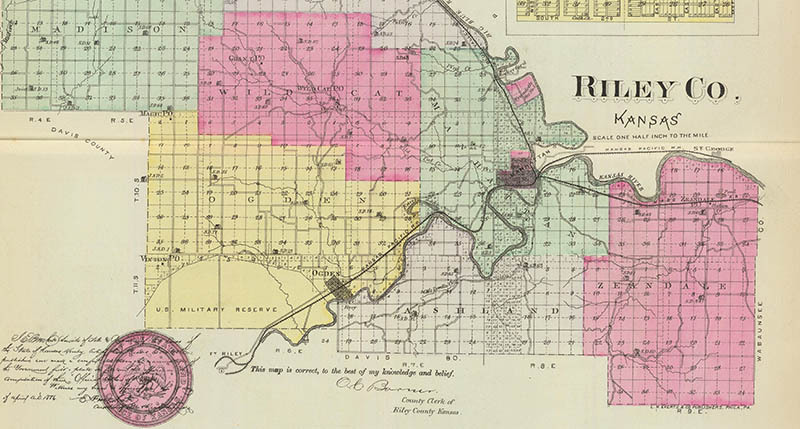 Below is a portion of the 1887 map of Riley County, Kansas. It’s important to look at the boundary maps for the time period that your ancestor lived there, as boundaries do change. The Atlas of Historical Historical County Boundaries on the Newberry Library's website features an animated timeline showing the evolution of each state's county boundaries. It also has text versions so you can see the information in more detail. ​A landowner or cadastral map is a special type of boundary map that shows the parcels of land and who owns them. While that may or may not be the same as the people who actually live there, these maps are an excellent way of piecing together the neighborhood. 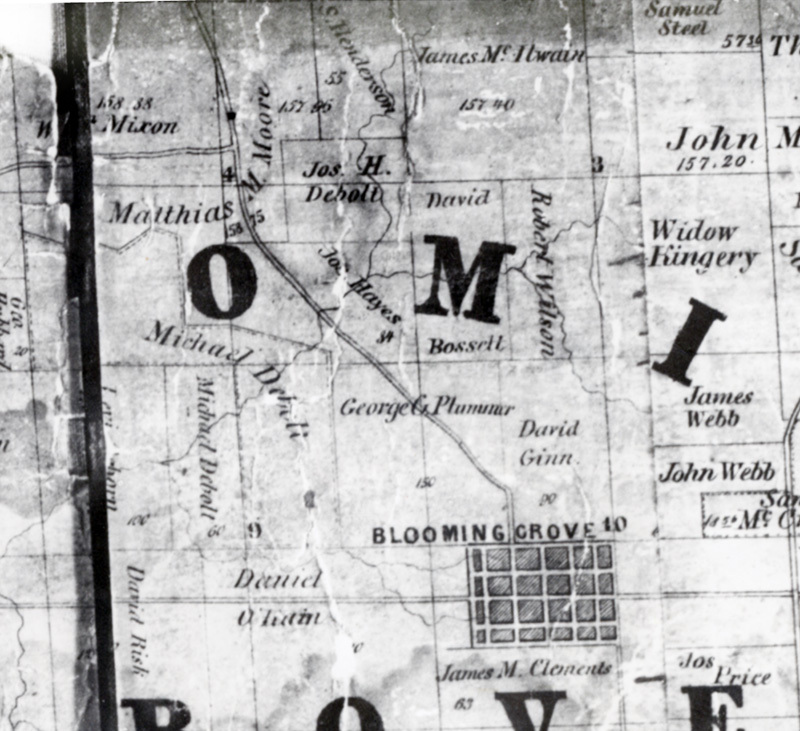 Below is part of the 1﻿858 Landowners Map of Franklin County, Indiana. 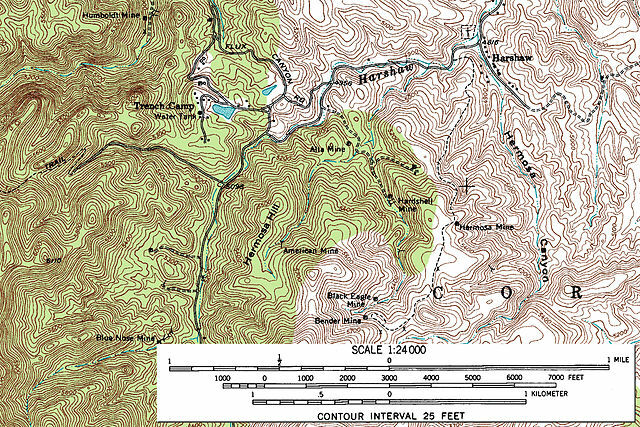 A topographic map (often called a topo map) shows the lay of the land. It shows the changes in elevation, waterways, etc. It can help us see why our ancestors moved in certain ways or why they did (or didn’t) do certain occupations. Not much flat land? Probably didn’t farm much corn or wheat. Attended a church further away than you expected? Maybe the terrain made it easier to get to that one than the church that was closer. Below is a topographic map of part of Santa Cruz County, ﻿﻿Arizona. Transportation maps include things like major roadways, railroads, and canals. This makes envisioning possible migration paths so much clearer. Transportation maps on a small scale can show inter-urban rail lines, which can help you see exactly how your ancestors got from place to place in their everyday lives. 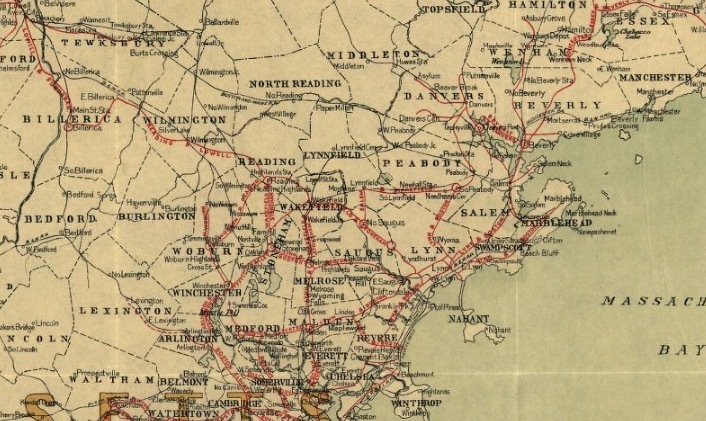 Below is a small portion of the "Electric railway map of eastern New England, 1898." What's your favorite type of map? 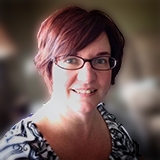 This entry was posted in Records and tagged maps by Amy Johnson Crow. Bookmark the permalink. A better question is: What is /not/ my favorite type of map? 😉 I love maps! I do, though, have a special affinity for cadastral and Sanborn maps for my own research. I do need to use topo maps more. Thanks! What is an OS map? Ordinance Survey – very detailed maps for the UK. Actually, I think it is spelled “Ordnance”. Great post! I love maps too! 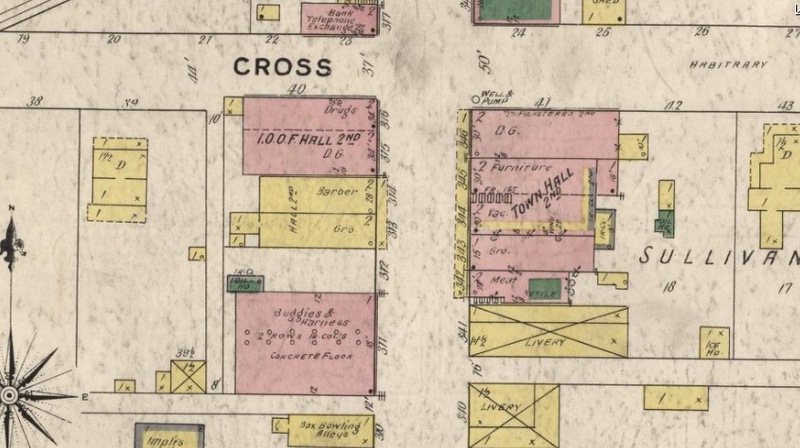 I love original property survey maps. The original 17th- and 18th-century ones for MD and VA grants can be closeups of cadastral maps, showing adjacent property owners, waterways and perhaps some geography. Some note existing buildings and timber. The 1799 Congressional surveys for some parts of Ohio can have surveyors’ notes on geography, types of woodland, waterways, paths and suitability for specific agricultural uses for each Section. At times, though, these are not easy to correlate with subsequent plats. And while usually not original surveys, plats of partitions can be miracles of detail. These might be found in connection with DE or PA Orphans Court orders, or other areas’ Chancery Court proceedings. Researchers do need specific knowledge of what might be available locally, and to pay attention when such things might be mentioned in later land records. Occasionally partition plats also were recorded in the deeds books themselves. Maps, maps and more maps. I love them all. I’ve don’t have any insurance maps, so I think I’ll try to find some of those. Thanks for the post and the links Amy. I am obsessed with maps! I even love seeing ones from others’ families. A great find for me this year was historygeo.com I have found many ancestors and can now understand how this family linked up with that one. I found a landowner map a few years ago that was absolutely fantastic. It was great to see the names of the neighbors and helped open my eyes to a few things. Thanks for the post! Like so many leaving comments here, I love maps! My question is what are the best places to find maps online? I know of some key collections, but most seems to be focused on a particular geography. 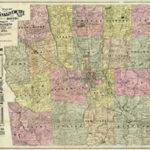 Are there not (United States) nationwide searchable map collections online? This is crazy!!! 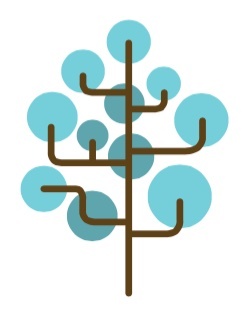 I just emailed about a half dozen family members to help research our family tree! My maternal grandmother always said we were related to Kevin Costner (even though her maiden name was Costner) I always thought she was just joking! Once you are looking at boundary and cadastral maps, it’s worth a visit to the General Land Office Records provided by the Bureau of Land Management at http://glorecords.blm.gov/ . Here you can search by names for patents issued to your ancestors and may find cadastral maps showing where that land was. The GLO data are some of the oldest available.